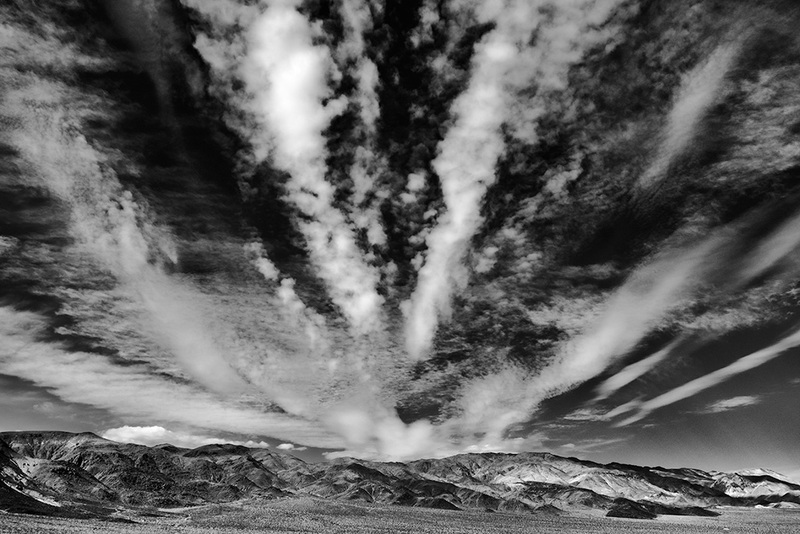 As we traveled from Trona to Death Valley, I saw this sky developing. The problem was finding a foreground worthy of putting with it. We drove for a few miles and I finally decided that the foreground was not near as important as the sky. The sky was the subject. As such I filled the frame with it and let the small strip of land give it a base. Oft times I’ll find myself suggesting this concept to those on a workshop. Ask yourself, what is the subject and if it is the sky, make it so. Sure it would have been nice to have an old abandoned building, rusted car or some other great subject to put with the great sky, but I’m okay with this just the way it is. John, your skies are amazing. How do you get your clouds to look so dramatic? In camera, or post-production? Whenever I try to take photos of interesting clouds, the end result is always washed out and lacking in detail. Hello Kim, thanks for your comment. Both, I use a polarizer most times to make the sky pop and then in post I’ll oft times work on the sky by itself separate from the foreground to maximize it. A bit of “Tonal Contrast” in Nik Color Efex Pro works wonders.